Banana Pancakes made with only 2 ingredients. Perfect for babies and big kids too! 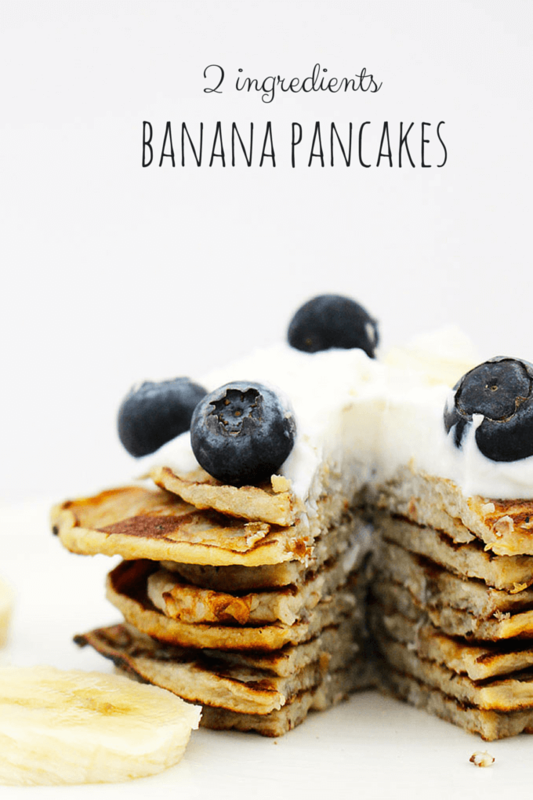 These banana pancakes are made with only two ingredients, egg and banana, making them gluten free, dairy free and refined sugar free. They are fantastic for baby led weaning but perfect for older kids too. We have been enjoying these super easy pancakes for a while now. They are so quick to make in the morning and Finn loves them. Mash one ripe banana and mix it together with two eggs. Fry spoonfuls of the mixture in a little coconut oil, flip and then enjoy. Simple, delicious, nutritious. This is a great recipe for getting your kids to help in the kitchen. Finn helps with the mashing of the banana and loves to crack the eggs into the bowl. Today I served them with some natural greek yogurt, sliced banana and blueberries. 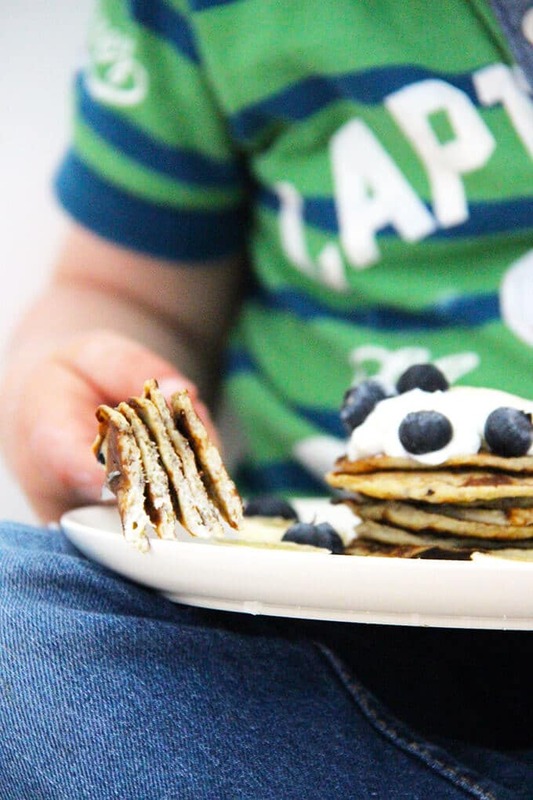 2 ingredient pancakes perfect for baby-led weaning, toddlers and older kids. Gluten free, dairy free and refined sugar free. Heat the coconut oil (or butter) in a frying pan over a medium heat. Fry for around 2 mins on each side. The pancakes are very delicate so take care when flipping. I can’t wait to try these banana pancakes tomorrow! I think my 20 month old grandson whom I care for on a regular basis is going to love them! I am looking forward to trying more of your recipes! Thank you so much!! Hi Mary, Thank you for your lovely comment! I hope your grandson enjoyed them! Hi Claudia, sorry for the delay in getting back to you. We have been moving house and I’ve been crazy busy with no internet! I was happy giving my babies eggs at 6 months and wasn’t told not too. However, I am not qualified to give advice and would always suggest you talk to a health professional. Thanks for taking the time to comment and rate, Jay. I’m loving the sound of the coconut flakes in these. Delicious! Great! My sons love them too and I love that they are so easy!